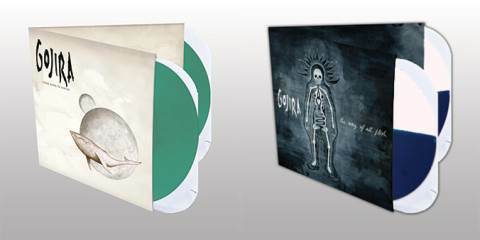 By popular demand, Prosthetic Records will soon issue gatefold double-LP editions of the two albums that rocketed the French progressive tech-death quartet GOJIRA from the European underground to international stardom.“From Mars To Sirius” and “The Way Of All Flesh” — two of the most acclaimed metal releases of the past decade — will be released on vinyl on August 27. Pre-orders are available now. Originally issued overseas in 2005, “From Mars To Sirius” — released byProsthetic in 2006, and never before available on LP in North America — was the Western Hemisphere’s formal introduction to GOJIRA. One ofMetalSucks‘ Top 10 “best metal albums of the 21st Century so far,” the album was supported by U.S. tours with the likes of LAMB OF GOD,CHILDREN OF BODOM, MACHINE HEAD, BEHEMOTH and AMON AMARTH. The gatefold 2LP set will be available in three 180-gram variants: “Eco-Green” (600 copies), “Mars Red” (200 copies) and “Sea Blue” (200 copies), the latter two of which are mail-order exclusives. Engineered, mixed and mastered by Logan Mader (FIVE FINGER DEATH PUNCH, DEVILDRIVER, FEAR FACTORY), follow-up “The Way Of All Flesh” (2008) cemented GOJIRA‘s status as one of metal’s most important acts. The band’s first release to crack The Billboard 200, the album — which features a guest appearance by LAMB OF GOD frontman Randy Blythe — was supported by tours with the likes of IN FLAMES and ALL THAT REMAINS, in addition to a month touring North American arenas withMETALLICA. The gatefold 2LP set marks the first time in three years that the album will be available on vinyl, and it will be offered in two new variants: 180-gram clear (500 copies), and a mail-order exclusive, standard-weight blue/white split vinyl (500 copies).